Sun, idleness and sweetness of life 6 km from the sea, between Cassis and Bandol. In the quiet of the Provencal countryside, discover our beautiful little stone house, with terrace and private garden of 100 m2 for 2 to 4 people. This is adjacent to the main villa, with independent access and places to live opposite to one another in order to preserve privacy. 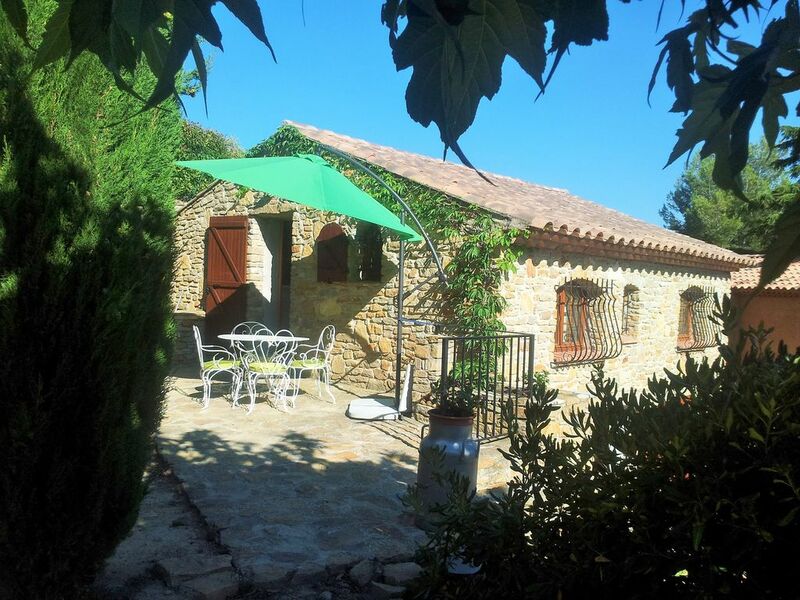 The lease is located in a beautiful one-hectare property between vines, olive trees, fig and almond trees. You will find all the charm of Provence and will be quiet lulled by the sound of cicadas (summer), while enjoying beautiful beach days or walks. We are in the heart of Bandol vineyard with all that it offers wineries to discover and wine AOC Bandol and Côtes de Provence to taste (in moderation of course). Beauty and Lecques beach is closest, there is a promenade all along it with parking and direct access to the sand. It benefits from the label 'Blue Flag' for the quality of its waters and ports. A living room decorated carefully with 2 armchairs and a sofa 2 seater convertible bed 140x190 cm (very thick mattress for comfort), LCD TV LG 32 '' (81cm) + DVD + Wi-Fi internet connection. An open kitchen (induction cooktop 2 burners, extractor hood, fridge / freezer, Senseo coffee maker, kettle, toaster, oven, microwave, dishes, utensils and kitchen sets, etc.) and a dining area. A cozy bedroom with new bed shape memory quality in 160 × 200 cm and large closets for storage. A bathroom with spacious corner shower, basin and beautiful faience, a large mirror and toilet. Hair dryer, iron and ironing board, fan, vacuum cleaner available. Outside, a beautiful terrace with a wrought iron garden table, umbrellas and deckchairs very comfortable to relax and enjoy the private garden in the shade of mulberry tree or sunbathing in the sun. We focus on a warm, personalized and friendly welcome to receive you at best. House very well maintained, clean and crisp. Private parking in the property. Products for basic maintenance provided. Our rental is not suitable for children under 6 and people with disabilities. The stay tax is included in the price. If you prefer to deposit a check or cash for the CAUTION, it's possible to do it! Thank you to inform me during your booking request so that I modify the quote. Charge possible linen optional. (Sheets, towels, tea towels, bath mats + Service Bed made at arrival) See us directly after booking. The final cleaning is not necessarily charged, it can be done by you before you leave, or be taken as an option. See us directly after booking. IF YOU REQUIRE ANY INFORMATION IN ENGLISH, feel free to send me an email. We really enjoyed staying at this place. The house was very beautiful, very comfortable and equipped with everything necessary. An ideal place for a couple, this is an amazing place! The owners were super-preventive and welcome to us in the highest degree. It was very pleasure to get from them a some presents: home local oil, wine, and wine again! Vanessa was a very kindly and positive owner. Thank you very much for such a reception in Provence! We would love to come back here in future, when weather will a little warmer. Thank you very much for your very good review. Thank you as well for your gifts, it is so kind of you ! Wir hatten eine tolle Urlaubszeit in diesem schönen Häuschen! Der Platz ist ideal für zwei Personen und es ist alles vorhanden, was man für einen angenehmen Urlaub braucht. Die Unterkunft ist sehr gepflegt und liegt ruhig, umgeben von vielen Weingütern. Trotzdem sind der Strand und viele interessante Städte mit dem Auto gut erreichbar. Besonders begeistert waren wir von unserer netten und aussergewöhnlich guten Gastgeberin Vanessa! Sie hat uns sehr nett empfangen (u.a. mit Wein im Kühlschrank und frischen Blumen in der Wohnung), hat uns viele gute Ausflugstips gegeben und war per Handy immer erreichbar. Vielen Dank für diesen schönen Urlaub! Wir haben eine tolle Woche an der Cote d'Azur in diesem schönen Appartement genossen. Ideal war die Lage und eine sehr schöne Außenterasse, auf der wir Frühstück und andere Mahlzeiten genießen konnten. Die Gastgeber waren sehr freundlich und diskret. Unverhofft bekamen wir einige Feigen und Jujuba Früchte aus eigener Ernte zum Geschenk :-) Auch das eigene Olivenöl war so gut, dass wir noch einen Vorrat nach Hause nehmen mussten. DA unser Französich nicht so "trittsicher" ist, war es von Vorteil, dass wir uns mit Vanessa auf Englisch verständigen konnten. Die Küche ist für das Frühstück und gelegentliche Mahlzeiten ausreichend. Alles ist sehr sauber und ordentlich. Wir waren zu zweit unterwegs und hatten ausreichend Platz. Sehr ruhiges Domizil, etwas abgelegen. We (young couple) spent the first two weeks of July in Vanessas little house and had a great time! Location: super quite, close to highway and interesting spots for day trips (Aix en Provence, St Tropez, National Parks, markets, beaches...). There is nothing around in walking distance, you have to use the car to get somewhere, but this wasn't a problem for us. Vanessa: Vanessa is the perfect host. She welcomed us with self made jam/olive oil, cookies, wine... Very reliable and easy to communicate with. She even sent us messages from time to time with local activities going on during our stay. Thanks Vanessa for the great time! Forfait linge de maison possible. (draps, serviettes de toilette, torchons, tapis de bains + service lit fait à l'arrivée) Voir directement avec nous après la réservation. Le ménage de fin de séjour n'est pas obligatoirement facturé, il peut être fait par vos soins avant votre départ, ou être pris en option. Voir directement avec nous après la réservation.